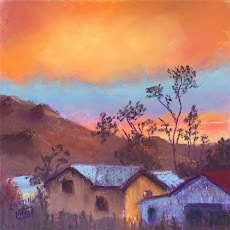 Jo Castillo Art Blog - Pastels and More: Me in Watercolor, Oh, Yeah! Me in Watercolor, Oh, Yeah! Number 2, portrait - Me except I'm older, fatter, etc. I could probably add some ink and perk it up a bit and cover some of the lack of expertise. Class today and will have these practice pieces critiqued and have some questions answered. Poor Pomona! I hope to do another quick landscape for the Scavenger Hunt today. I recognize that lady! 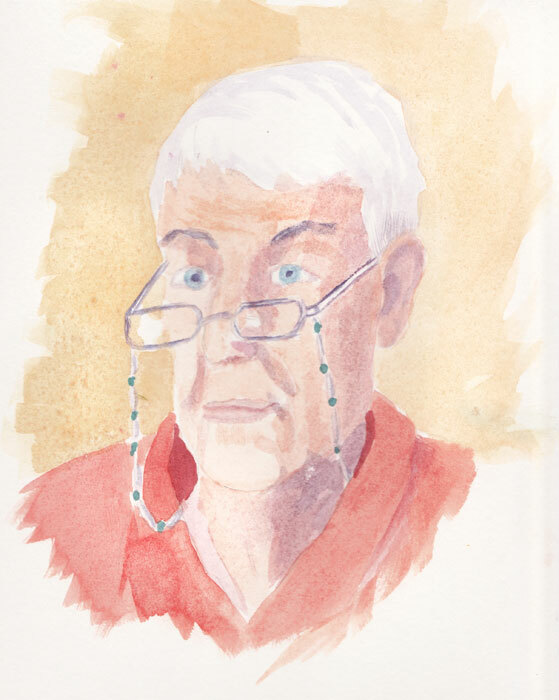 Watercolor portraits are very difficult. I keep trying, but I'm never quite satisfied with mine. Thanks, Jennifer Rose. I guess you can tell it is me, like in a bad mirror. Ha. Bag Blog, thank you. I'm not very good at seeing faces to draw them. Self portraits are not easy. We always show the concentration I think. I'm happy to not be a portrait painter!